The exchange-traded fund has paid its investors well. Income investors have turned to dividend stocks to get the cash they need from their portfolios, and the Vanguard Dividend Appreciation ETF (NYSEMKT:VIG) has become one of the most popular vehicles for investing in dividend stocks. Unlike many dividend ETFs, Vanguard Dividend Appreciation focuses not only on high current yield but also on companies that can grow their dividends over time. 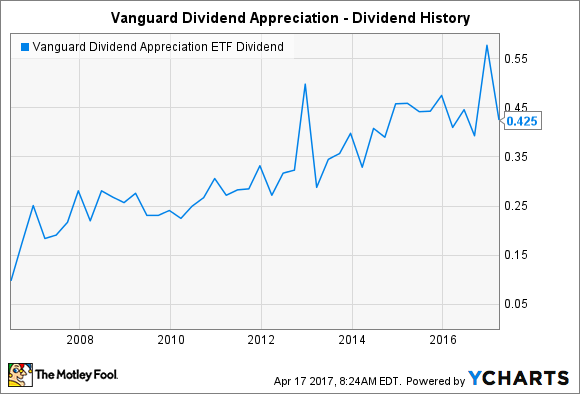 Below, we'll look more closely at the history of dividends that the Vanguard Dividend Appreciation ETF has paid to its investors and whether the upward trend is likely to continue into the future. How has Vanguard Dividend Appreciation treated investors in the past? The Vanguard Dividend Appreciation ETF follows the same general game plan as most exchange-traded funds do, passing through the dividends it receives from its stock holdings and paying them to ETF shareholders through quarterly distributions. Although most of the ETF's holdings pay regular quarterly payments, some follow less regular schedules. As a result, the Vanguard ETF's quarterly payouts are typically different from period to period. Yet over time, the upward track of dividend income is still evident from the chart below. VIG Dividend data by YCharts. What might be the most remarkable thing about the Vanguard Dividend Appreciation ETF's dividend history is just how good a job it did surviving difficult economic and market situations. During the financial crisis in 2008 and 2009, for instance, dividend distributions saw their long-term growth take a pause. However, by 2010, things were back to normal, and the overall upward trend resumed for shareholder payouts. That experience was far different from dividend ETFs that focused solely on high dividend yields. What has kept the Vanguard ETF's dividends climbing? The most important aspect of Vanguard Dividend Appreciation's success in keeping its quarterly payouts moving higher is its investment philosophy with respect to picking stocks. For the Vanguard ETF, it's just as important for a stock to demonstrate a long history of rising dividends as it is to have a solid current yield. When a company has a consistent track record of raising its quarterly payouts even under circumstances in which its industry is facing challenges, investors can take confidence that the company knows how to navigate the cyclical nature of its business and still foster long-term growth. Moreover, stocks that have long streaks of rising dividends are loath to bring those streaks to an end by doing a dividend cut. That doesn't mean that all such companies are successful in avoiding tough times, and many stocks that had sizable periods of consecutive annual dividend increases had to deal with adversity and succumb to terrible financial conditions during and after the 2008 recession. But the vast majority keeps their streaks alive, and that keeps the income flowing in for Vanguard Dividend Appreciation investors. Can Vanguard Dividend Appreciation's distributions keep getting bigger? One thing that investors in Vanguard Dividend Appreciation need to keep in mind is that the ETF's history isn't all that long. With a track record that goes back only to the mid-2000s, the exchange traded fund has seen an atypically harsh bear market and an extremely long bull market recovery. Whether the dividend ETF will behave similarly during a more normal and less volatile business cycle remains to be seen. Moreover, with the unprecedented long period of low interest rates and its impact on fixed-income investing, some investors worry that valuations on dividend stocks have climbed beyond safe levels. If that's true, a downturn could leave dividend stocks more vulnerable than in past business cycles. However, the Vanguard Dividend Appreciation ETF has done well with its core mission of finding solid blue-chip stocks with the ability to weather economic and business storms. As long as investors want dividend stocks and companies keep making payouts, Vanguard Dividend Appreciation should have plenty of options to give its investors what they want in their investment portfolios. Is Vanguard Dividend Appreciation ETF a Buy? Which Vanguard Dividend ETF Is Winning the Race in 2018?